TomTom have been the celebrated champions of GPS gadgetry for a while now. The company has however taken it to the next level with their sport-friendly Bandit GPS action camera that syncs with your smartphone to transmit footage directly to it. This makes perfect sense for the adventurous who wouldn’t like investing their time and energy on connecting their devices while on a rugged mountain trail. All you have to do is give your synchronized smartphone a shake and behold, you have your footage ready to be shared. The inbuilt media server enables the devices to deal with the file sizes and also edit the files before having them shared. The Bandit is capable of automatically tagging highlights on speed, acceleration, G-Force and even heart rate at the point of video capture. You can also add music to the videos that are edited. 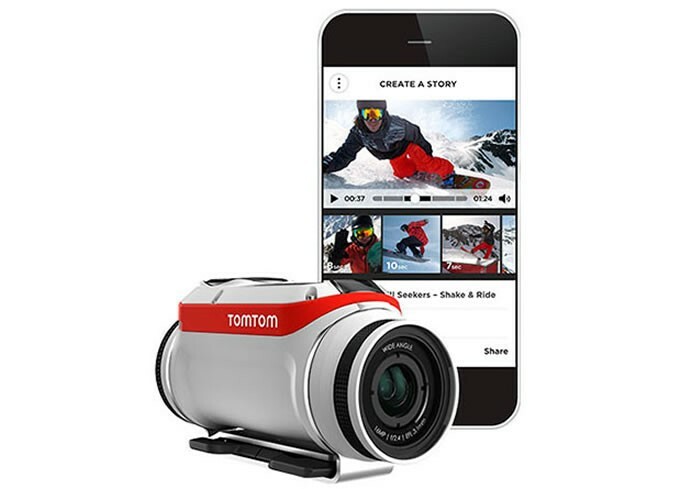 The camera can easily capture a 1080p video at 30 to 60 frames per second. High intensity sport enthusiasts would be thrilled to know that you can exceed capture up to 120 fps at a resolution of 720p.The Bandit app is only available on iOS presently. It will arrive in June for $475. The Android version is in the works.